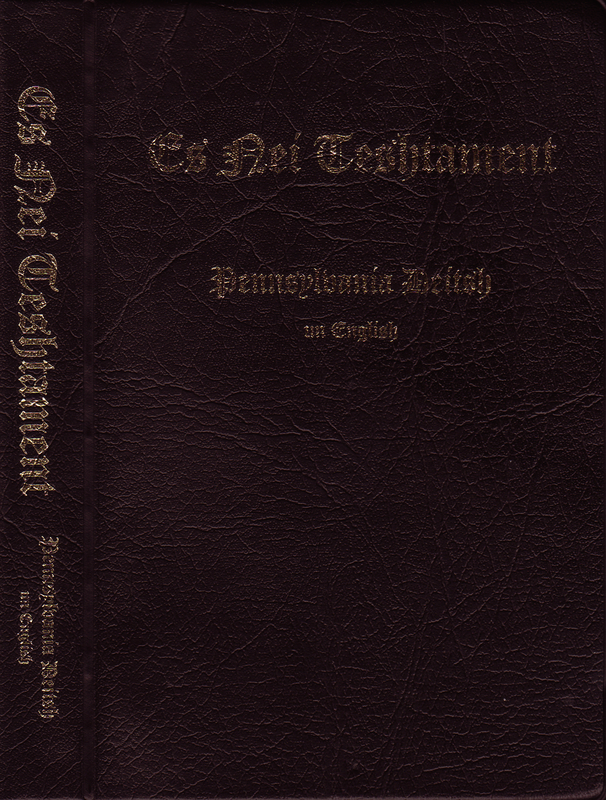 Click here for sample verses from the version by the Pennsylvania Deitsh Translation Commitee. 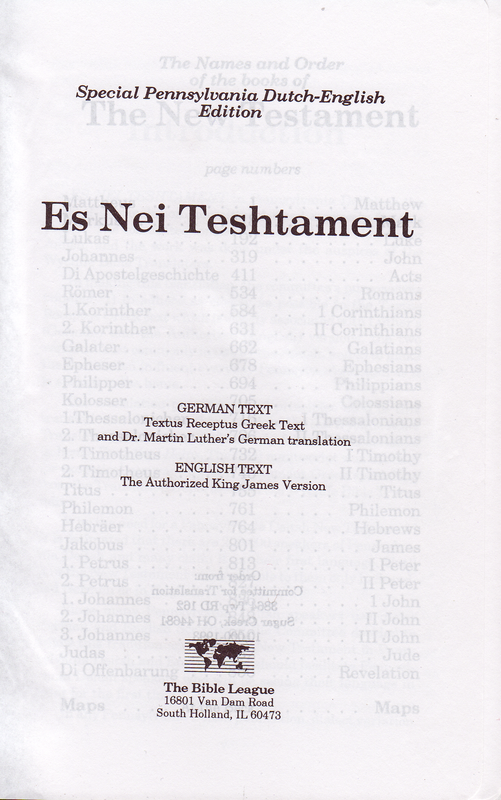 Contents: New Testament ☛ German Text: Textus Receptus Greek Text and Dr. Martin Luthers German Translation. 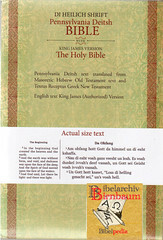 ☛ English Text: The Authorized King James Version. Introduction, Pronunciation Guide, 2 colour maps. Comments: FlexCover octavo, 922 pp. The introductory notes - unfortunately not dated - say that this rendering has been made under the auspices of the Wycliffe Bible Translators. The purpose is twofold: 1.) 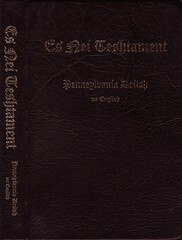 to adhere as closely as possible to the TR Greek text which is closely associated with Luther's translation and the Authorized Version, both most commonly used by the Amish, and 2.) to make the translation in fluent everyday Pennsylvania Deitsh as it is spoken essentially by the Amish in Ohio. – The reader which is used to High German only has to get used to this kind of pronunciation which is quite unusual. Though it is stated that the translation is from the TR, it has been corrected according to the Greek, which can clearly be seen in Rev. 22:19 where is says: »dann nemd Gott sei dayl vekk fu'm bohm* funn layva« compared to » God shall take away his part out of the book of life«, *»bohm meaning »tree«, which is the correct reading according to the Greek, rather than »book«, which is borrowed from the Vulgate. 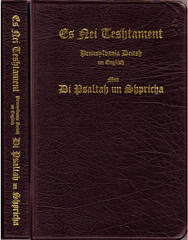 Contents: New Testament, Psalms and Proverbs ☛ Pennsylvania Deitsh Text translated from Textus Receptus Greek Text and Dr. Martin Luther‘s German Translation. 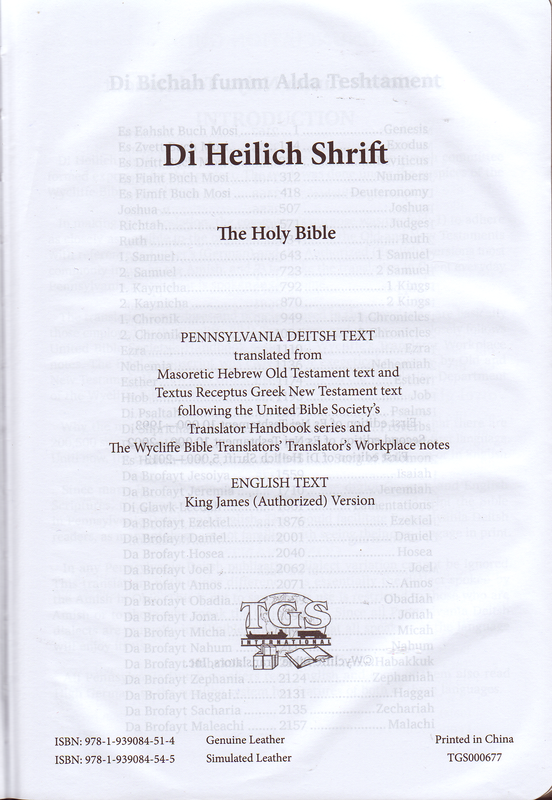 ☛ English Text: The Authorized King James Version. Introduction, Pronunciation Guide, 2 colour maps. Comments: FlexCover octavo, VIII, 1094 and (14) pp. 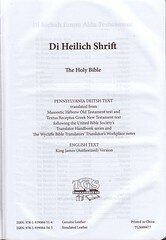 Introduction, Pronunciation Guide and Bible Text presentation as in the first edition. 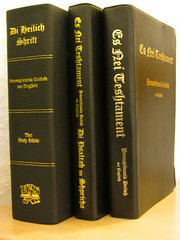 In the undated Preface to the Second Printing the translators regret that due to financial limitations the English Scripture Text (KJV) for the Psalms and Proverbs had to be discontinued. 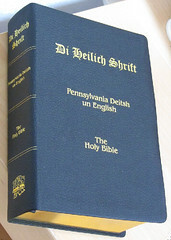 They hope that with the publishing of a whole Bible it can be made available in both languages. Publisher: Berlin, OH (U. S. A.) : TGS International. Comments: Hardbound octavo with thread stitching. Leather or simulated leather, gilt edged; VIII & 2836 pp. plus three color maps. 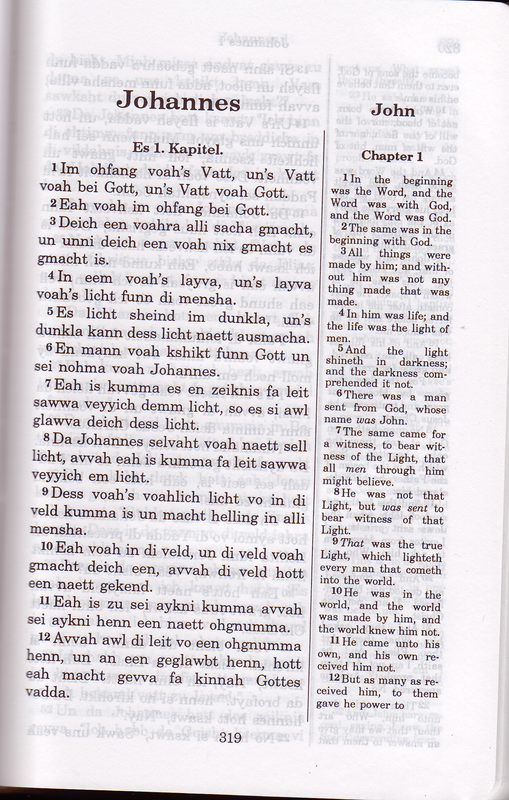 Scripture text arrangement as shown in photo. 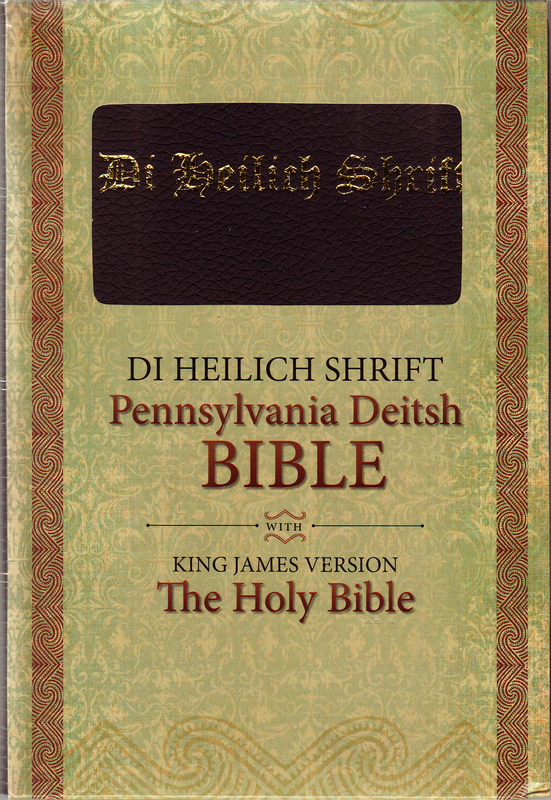 As promised in the NT plus Psalms and Proverbs, the text of the KJV is presented completely. 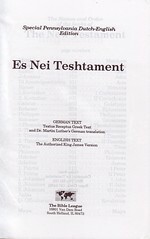 The Deitshe text of the OT has been revised at places and amended where necessary, e.g. in Prov. 8:22. 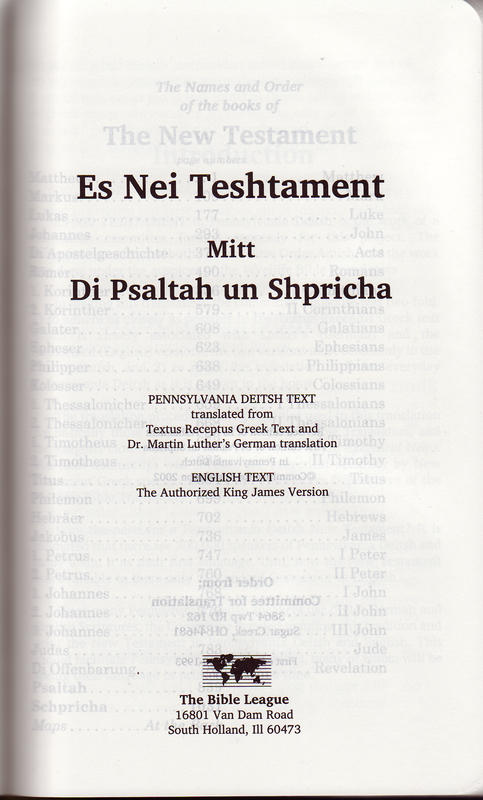 As with the NT above, a self teaching primer titled: Ich lann [sic!] 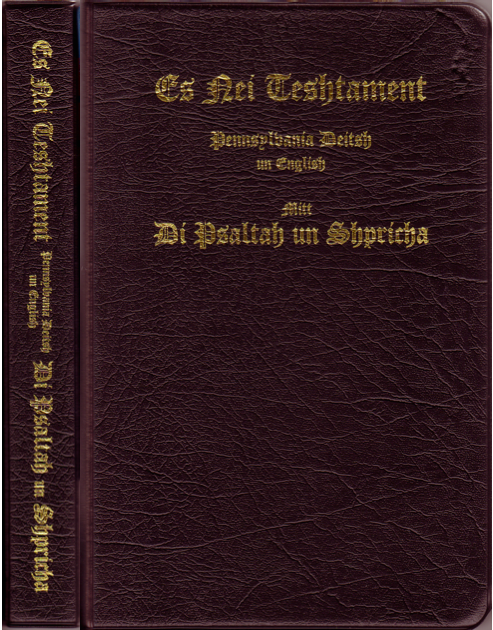 Pennsylvania Deitsh laysa [should read 'kann'] ("I can read Pennsylvania Dutch") is provided.